Mighty Mouse is a little guy that packs a big wallop. This little super hero mouse shows the world that super powers aren’t just for the big guys. Here are some lessons that can be learned from Mighty Mouse and his adventures. Big things come in small packages – He is just a little mouse, but Mighty Mouse is full of surprises. His super powers set him apart from all the other mice. Everybody has some special gifts that only they can offer the world. Just because you are little doesn’t mean you are weak – Even though Mighty Mouse is small, he is a super hero known for saving the day. He not only saves other mice from destruction, he also saves other creatures. Being a little guy doesn’t mean you are weak or incapable of making a difference. Be willing to fight for what’s right – Mighty Mouse is always fighting crime and the bad guys. He sets an example for standing up for the right things and for defending the cause of the defenseless. Constant bullying and teasing can create a villain – In an episode of “The New Adventures of Mighty Mouse,” Petey Pate becomes an arch villain because of all the teasing and bullying he endures due to his bald, pink head. Even though he wants to be good, eventually all the ridicule gets to him, and he turns out bad. Not everyone who gets picked on turns out to be a villain, but history has shown that most villains were physically and emotionally abused by others. It’s always best to treat others with respect. Learn to think fast – In many episodes, Mighty Mouse needs to think fast to come up with a way to defeat the villain’s attacks against him. The ability to think fast to get yourself out of trouble or keep yourself out of trouble is a valuable asset. Crime does not pay – It’s a cliché that used to show up in many cartoons. Mighty Mouse always gets the bad guys. Sooner or later those who choose to do wrong will get caught and will have to deal with the consequences. Orphans can grow up to be great – In the first season of “The New Adventures of Mighty Mouse,” Scrappy Mouse yearns to be like Mighty Mouse. However, he wonders if it’s possible for him to be such a good person since he doesn’t have a mother and father like the other little mice. Pearl Pureheart tells him about Mighty Mouse’s childhood and how he was an orphan raised by squirrels. Scrappy comes to understand that it isn’t the circumstances of your birth, but rather the choices you make, that determine your future. Kids need to know that their choices have a direct impact on what their future success will look like. Everyone has a weakness – Superman’s weakness is kryptonite and Mighty Mouse’s weakness is limburger cheese. Everyone has a weakness and knowing what your weaknesses are and doing what you can to overcome them or deal with them makes a huge difference in how things will go for you. Learn to be a problem solver – One thing that shows up in a lot of Mighty Mouse episodes is that fact that the other mice depend on Mighty Mouse because he is a good problem solver. People appreciate those who have the ability to come up with workable solutions to problems. Developing critical thinking skills to solve problems is something that needs to be encouraged. 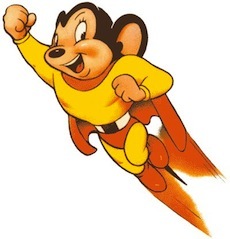 Choose to work for the greater good – Mighty Mouse made a conscious decision to use his super powers for the good of all. There are those who have abilities to do wonderful things but they don’t share their talents or else they use them for their own gain. Making a decision to use your abilities for the good of all is a noble choice. There are some excellent messages in the episodes of Mighty Mouse. Some are hidden and others are very straight forward. When kids are taught how to find the teachings in the stories, they can learn a lot of valuable lessons.